January | 2019 | IMPROVEACRATI.....improve.....grow.....excel ! Thankfully, no loggers took it down, nor forest fires or earthquakes! Just a quiet life in a California forest for all these years … 3,200! Imagine, this tree was already 700 years old during the height of ancient Greece’s civilization and 1200 years old when Jesus lived while Rome was well into its rule of most of the western world and points beyond. The trunk of The President measures 27 feet across, with 2 needles from base to top. Because of its unbelievable size, this tree has never been photographed in its entirety, until now.National Geographic photographers have worked along with scientists to try and create the firstphoto that shows The President in all its glory. They had to climb the tree with pulleys and levers and took thousands of photos. Of those, they selected 126 and stitched them together to get this incredible portrait of The President. And here it is: The man standing near the trunk of the tree is a good indicator of the tree’s size. Incredible, isn’t it? Listening to the fascinating tale of the longest serving Commandant of Chitral Scouts, known for his association with the Afghan jihad, who has become a mythical figure in the area. The Colonel left the Commandant’s House at the small town of Darosh in Chitral District in the evening, presumably for the last time. He was headed for Peshawar to attend his farewell dinner which was planned for the next evening at Bala-Hisar Fort, the headquarters of Frontier Corps. The next day was his last in service and the dinner thus arranged was to honour him. A few eulogising speeches, a shield, handshakes and then he would pass into oblivion. The sentry on evening duty at the Commandant’s House was astounded to see the headlights of the approaching jeep. Unexpectedly, the Colonel had returned soon after he left home. He parked the jeep and let the driver retire for the day. The sentry wondered at the changed plan. Now the Colonel would not be able to make it to his farewell dinner in Peshawar, even if he leaves at dawn the next day. But it was not the sentry’s business to question the travel itinerary of his commander and so he kept wondering. Close to midnight, he saw the silhouette of the Colonel strolling in the lawn with his dogs. Twice he paused, patted his dogs, looked up towards the heaven and murmured something in an inaudible tone. After a while, he walked past the sentry, asked him to tie up the dogs and went inside the house. Soon after morning prayers, his close friend Khursheed Ali, a Darosh non-military local, rushed to the Commandant House on the urgent call from the major stationed in Darosh. The officers of FC and the police SHO were waiting for him. The eerie silence was broken by the worried major who asked the sentry to break open the Colonel’s bedroom door which was bolted from inside. There he was, lying on the bed with a pistol dangling loosely in his hand. On the table was a small note which explained how his private possession was to be distributed among the people he cared most. Among them was Khursheed Ali who got the two dogs to look after, while all other pets (including his favourite Markhor), photographs, furniture and belongings were willed to the FC Mess. He left some money for the sentry; the rest, after expenditure on his funeral service, went to his brother. Though the short note did indicate a few things, it could not explain ‘why’ he did what he did! On August 3, 1989, as per his wishes, he was buried in the shade of a Chinar tree which lay across the Commandant House, in a small ground purchased by the Colonel in his lifetime. Thousands of people descended from the valleys of Chitral, including the Kafirs, to attend his funeral. A smartly turned out contingent of FC, with misty eyes, fired a volley of shots in the air. Thus ended the story of Colonel Murad Khan, the longest serving Commandant of Chitral Scouts, who lies buried in Darosh. I first heard about Colonel Murad in November 2013 while having tea in the office of my friend Major General (now Lt General) Ghayur Mahmood at Bala Hisar Fort. I was recently posted in Khyber Pakhtunkhwa as Secretary Excise and Taxation and was assigned additional responsibilities by the government to look after the Chitral district. The same week I crossed the torturous Lowari pass and descended into Darosh, a town 40 kilometres short of Chitral. The whole bazaar seems to be buzzing with stories about the Colonel. My friend Khalid, an excellent polo player, took me to Reshun village some 50kms beyond Chitral on the road leading to Shandur. There we met a short and muscular retired Havaldar of Chitral Scouts. Sher Ali in his heydays was also a great polo player and had represented Chitral umpteen times in the famous Shandur Mela. In 1980, Col Murad had spotted him at Shandur and offered him a job in Chitral Scouts as a sowar. The job raised the social status of the polo player and ended in a steaming affair with a girl whose rich father refused to accept him in his household. That year, a dejected Sher Ali dropped out of the polo team, and his travails reached the Colonel’s ears. Next morning the Colonel made him ‘sit next to him’, drove the jeep at a furious pace, followed by a detachment of scouts in other vehicles and in three hours reached his village. The girl’s father fearing arrest escaped in the mountains. Geoffrey Moorhouse, a travel writer, historian and a Fellow of the Royal Geographical Society and Royal Society of Literature, had also met Colonel Murad in Chitral. In his book To The Frontier (p 1984) he had described the Colonel as a shy, bald, stocky man who smiled appealingly but never laughed and offered his opinion only when asked. Later, on the Colonel’s invitation, Moorhouse visited Chitral Scout’s headquarters at Darosh where he showed him his pet Markhor, a ridge which marked the Durand Line, Christmas cards from old British officers of the regiment and other memorabilia. What impressed Moorhouse most was his knowledge about the Afghan jihad across the border and that he “made study of Chitral his great pastime since he was posted here”. The Colonel was very proud of his troops whom he always referred as ‘my boys’. However, he proved the pundits wrong by becoming the longest serving commandant of Chitral scouts. His popularity among the masses and knowledge of the terrain made him almost indispensable for the modern Great Game defined as Afghan jihad. His fame grew beyond Lowari pass down to the GHQ in Rawalpindi and was given extensions in service twice by General Zia, something unheard of in Army. I met Khursheed Ali at his residence in Darosh. In the early 1980s, Ali was an ‘angry young’ reformer who was made the member of Zia’s Majlis-e-Shoora. He was the closest friend of the old Colonel and fondly narrated anecdotes of bygone era. Once in 1980, when the Afghan war was at its height, a Russian plane came strafing over the mess while they were sipping tea in the lawn. “All of us dived for cover, but ‘our’ Colonel kept calmly sitting on the chair smoking his cigarette.” Colonel Sahab used to resolve domestic and property disputes of the people of Chitral, helped them in getting education, organising sports tournaments and finding jobs for the deserving ones. Sher Ali was one of the many beneficiaries of his benevolence. Every family in Chitral owned him; that explained his fame and popularity in the valleys. Both the friends were close to Zia who would give them preferential treatment whenever he visited Chitral. The plane crash of General Zia is said to have brought down curtain on the Colonel’s career. In 1989, Prime Minister Benazir Bhutto visited Chiral to witness the famous Shandhur Festival where polo is fiercely contested between Chitral and Gilgit. After the match, she was ushered to the Chitral Scouts Mess for refreshments. Lo and behold, she was greeted by a large size portrait of General Zia which adorned the wall of the main hall, still smiling under his greasy moustaches. Bhutto was known to be magnanimous in such matters and hardly took any notice of this slip. However, there were people in her entourage who were more loyal than others. As the story goes, the then interior minister took the Colonel aside and gave him some sure tips about ‘royal’ protocol. In Chitral, I was repeatedly told this incident was the pretext used for denying Colonel Murad further extension of service which he desperately desired. Khursheed Ali, his closet friend, however opined that though Colonel Murad had shared with him his desire for another extension, he knew deep down that his wish was like the proverbial wild horse. Army discipline discourages extensions of any sort. He had already created a record of getting two against the backdrop of the neo ‘Great Game’, but with the Afghan issue almost settled, the usefulness of Colonel Murad had also dwindled to the lowest ebb. In the post-Zia era, the new army chief hardly knew about the Colonel’s exploits in Chitral. The die was cast. Four months before his retirement, while gossiping with his close circle as to why people commit suicide, he casually inquired from the local doctor the easiest mode of committing it. Then he placed his hand above his ears and gently moved his middle finger as if he was pulling the trigger. “He winked at us and the room echoed with laughter!” Kursheed Ali realised the significance of this act a little too late. I wanted to know more about Colonel’s family. It took me six months and more visits to Khursheed Sahab’s home in Darosh to pick up pieces of jigsaw puzzle. The Colonel, a handsome lad in his village, had fallen in love with his cousin. But before the match could be formalised, he had joined the army and the two kept exchanging letters. However, their stars were crossed. Unable to cope with the situation, he quietly left home but told his mother he would never come back home again. As you descend from the Lowari pass and drive past the town of Darosh towards Chitral, do stop for a while in the bazaar. At some roadside inn, while sipping the hot milky tea, somebody would turn around to narrate the story of our old Colonel. You’re walking on some touchy ground here, my friend. The Wehrmacht were very different from the Waffen SS. The Wehrmacht were Germans. The professional soldiers that officers and enlisted men of the Allied armies fought against for years but respected. There weren’t too many hard feelings from Allies to Wehrmacht or Wehrmacht to Allies (Unless you were Russian). When one side took soldiers on the other side prisoner, they generally treated their enemies well (Again, unless they were taken by the Russians). In the Nuremberg Trials, the Wehrmacht were spared charges of war crimes, and were not classified as a criminal organization. Any Wehrmacht war criminals were tried on an insdividual basis and weren’t considered to represent the whole army. The SS, on the other hand, were Nazis. They were Adolf Hitler’s right hand. The SS were the leading actors in the Holocaust. They did not treat their enemies well, and the Allies treated them in kind. Waffen SS prisoners would be treated far worse than others and their officers would often be shot. Many SS generals were tried for war crimes and killed after the Nuremberg Trials and the SS itself was classified as a criminal organization. I think Wehrmacht veterans should be treated better and with a degree or sympathy. They received the brunt of the war, and often times didn’t want to fight in the first place. They hated the Nazis for what they did to Germany. SS veterans should probably not be given too much sympathy depending on who they are. A lot of SS veterans alive today were Hitler Youth child soldiers that were forced into service. A friend of mine from Germany said that her grandfather enlisted in the SS late in the war when he was 16 years old. He did so to look like a “good German” and to spare his family from the Nazis wrath. At the time, the Nazis were going door to door forcing young boys like him into service and threatening the parents of the boys if they tried to stop the conscription. e was taken prisoner by a colored regiment of the US Army and was treated well, because of his age. One of his captors would actually bring him chocolate bars from his rations in the POW camp and would say that the chocolate was “for the horses”, and wink at him. Today, millions of Sikhs and their friends around the world are celebrating Gurpurab, but few outside India know the significance of this day or its history. It’s the 543rd birth anniversary of Guru Nanak Dev, the founder of the Sikh faith and one of the greatest symbols of pluralism and tolerance in the world. The 5,000-year old Indian civilization, born on the banks of the Indus and nurtured for many millennia by the Ganges, still enchants the rest of the world. With a cacophony of cultures and a myriad of languages, India is truly incredible. A place where diversity is not just taught, but experienced as life itself. The land of Krishna and the Vedas is the natural home to Hinduism, but under its umbrella Hinduism has nurtured the other major religions of the world and provided refuge to those fleeing persecution. India has accepted all without any conditions and stands a power that has never once invaded its neighbours throughout its chequered history.Mahatma Gandhi may epitomize India in the West, but he is just one of the many towering figures of history that have shaped the land, its culture and its religions. Poets such as Tagore and Iqbal immortalized India in verse while emperors like Asoka and Akbar ruled over dazzling domains that stunned the visitor. Among the great philosophers and thinkers that India gifted to the world are two men who tower above the rest- Buddha and Guru Nanak Dev, the founders of Buddhism and Sikhism. While Buddha is well known in the West as a result of his creed and followers, Guru Nanak, whose birthday we celebrate today is yet to be discovered. Nankana Sahib, a place where the Guru spent his childhood with Muslim and Hindu friends is a Bethlehem without Christians; a Medina without Muslims. The city of Nankana Sahib lies near Lahore, my maternal ancestral home, where my mother and father were born. My mother told me how she as a Muslim girl grew up with Sikh neighbors and how she was part of the Sikh family’s celebrations at the time of Gurpurab and how she would travel with her friend to Nankana Sahib. Decades later she would still recall her lost friend who left Pakistan to seek refuge across the border. Today Nankana Sahib celebrates, but there are no Muslim girls accompanying their Sikh friends. None. It is sad.Sad, because Sikhism and Guru Nanak were intertwined with Islam and Muslims. Five hundred years later, a border divides Muslim and Sikh Punjabis. A border where two nuclear armies and a million men face each other. As a Muslim Punjabi I feel the British in dividing Punjab separated my soul from my body and left the two to survive on their own. Muslim Punjabis lost their neighbours and family friends of generations. Most of all they lost their language that today languishes as a second-class tongue in its own home. We kept Nankana Sahib, but lost the Guru.However, the tragedy that befell the Sikhs was far more ominous and deserves special mention. For Sikhs, the Punjabi cities of Lahore and Gujranwala, Nankana Sahib and Rawalpindi were their hometowns and had shared a history with their gurus. With the 1947 Partition, not only was Punjab divided, but the Sikhs were ethnically cleansed from Pakistan’s Punjab. As a result of the creation of the Islamic State of Pakistan, the Sikhs lost absolute access to the following holy sites: Gurdwara Janam Asthan, the birthplace of Guru Nanak, in Nankana Sahib; Gurdwara Panji Sahib in Hasan Abdal; Gurdwara Dera Sahib in Lahore, where the Fifth Guru, Arjun Dev, was killed; Gurudwara Kartarpur Sahib in Kartarpur, where Guru Nanak died; and, of course, the Shrine of Maharaja Ranjit Singh in Lahore. Even though we Muslims despair the occupation of Jerusalem, we still have the comfort of knowing that Muslims still live in and around the Dome of the Rock and the Al-Aqsa Mosque. But what about the Sikhs? To feel their pain, Muslims need to imagine how outraged we would feel if, God forbid, Mecca and Medina were cleansed of all Muslims and fell under the occupation of, say, Ethiopia. How can we Muslims ask for the liberation of Muslim lands while we institutionalize the exclusion and ethnic cleansing of all Sikhs from their holy sites inside an Islamic state? 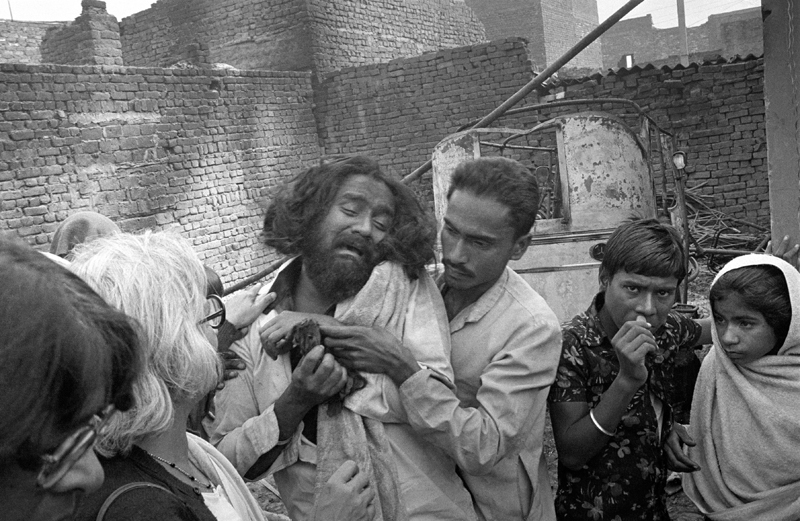 Muslims who cannot empathize with the loss of the Sikhs need to ask themselves why they don’t. Before 1947, Punjabi Muslims did not consider Sikhism as an adversarial faith. After all, from the Muslim perspective, Sikhism was the combination of the teachings of Sufism, which was rooted in Islamic thought and the Bhakti movement, an organic link to Hindu philosophy. It is true that Moghul emperors had been particularly vicious and cruel to the leaders of the Sikh faith, but these Moghuls were not acting as representatives of Islam. Not only that, the Moghuls inflicted even harsher punishments on their fellow Muslims. The Sewa Panthi tradition flourished in southwest Punjab for nearly 12 generations until 1947. This sect (variously known as Sewa Panthis, Sewa Dassiey, and Addan Shahis), is best symbolized by Bhai Ghaniya, who aided wounded Sikh and Muslim soldiers alike during the Tenth Sikh Guru’s wars with Moghuls. Sewa Panthis wore distinctive white robes.They introduced a new dimension to the subcontinental religious philosophies. They believed that sewa (helping the needy) was the highest form of spiritual meditation — higher than singing hymns or reciting holy books. The creation of Pakistan dealt a devastating blow to the Sewa Panthis and they never got truly transplanted in the new “East” Punjab. The organic relationship between philosophies and land, indeed, requires native soil for ideas to bloom. Other such sects and deras (groups) that made up the composite Sikh faith of the 19th and early 20th centuries included Namdharis, Nirankaris, Radha Soamis, Nirmaley, and Sidhs — all were pushed to the margins, or even out of Sikhism, after the partition. The tragedy of the division of Punjab is best captured in a moving poem by the first prominent woman Punjabi poet, novelist, and essayist Amrita Pritam, “Ujj akhaan Waris Shah noo” (An Ode to Waris Shah), which she is said to have written while escaping in a train with her family from Pakistan to India. Make mercy your Mosque, Faith your Prayer Mat, what is just and lawful your Qu’ran, Modesty your Circumcision,and civility your Fast. So shall you be a Muslim. Make right conduct your Ka’aba,Truth your Pir, andgood deeds your Kalma and prayers. Can you see this stealth fighter? So can everyone else’s radar! Yeah, I know most of you are calling bullsh*t immediately, but hear me out. For all its talk, China isn’t currently capable of global reach, and isn’t expected to be until 2030. It has a relatively small number of early-warning aircraft and aerial tankers. Most of its aerial fleet are licenses or rip-offs of other, better fighting systems. 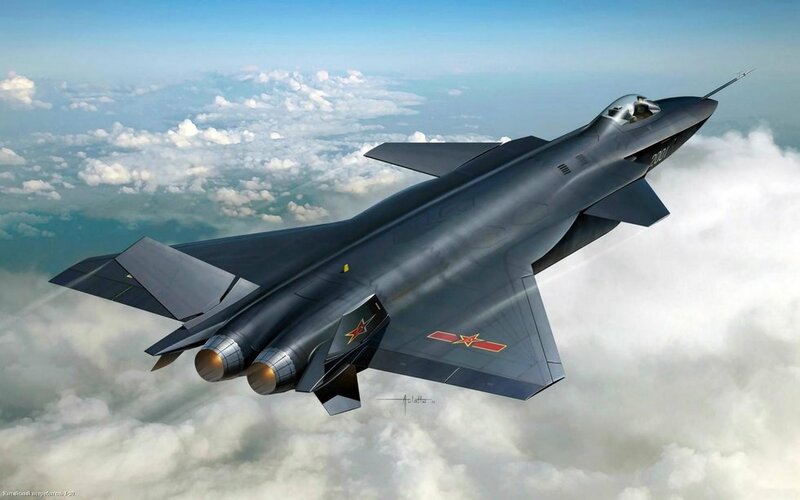 And the vaunted Chinese Chengdu J-20 fighter was rushed into production with a less-than-adequate engine, which negates any stealth capabilities it has and weakens its performance as a fifth-gen fighter. That’s a pretty embarrassing misstep for an air force that wants to strike fear in the hearts of the world’s second-largest air force: the U.S. Navy. More than that, when was the last time China did anything with its air force other than attempt to intimidate weaker neighbors in the South China Sea? Historically, the People’s Liberation Army Air Force has a tendency to get in way over its head. It wasn’t a real factor in the Chinese wars with India and Vietnam (though you’d think an air force in the 20th century would be), but where it was a factor – the Korean War, the Taiwan Strait Crises, and the U.S.-Vietnam War – a lack of any air combat doctrine and investment in air power led to heavy losses and big lessons for the PLAAF. It wasn’t until after the Gulf War of 1991 that Chinese leaders decided to really give air power another shot, both in terms of technology and investment. China still has a long way to go. 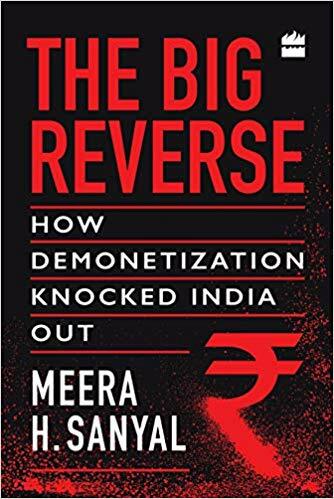 A trenchant critic of the November 2016 demonetisation – when Prime Minister Narendra Modi declared that Rs 1000 and Rs 500 currency notes would no longer be legal tender – Meera Sanyal brought out a book length analysis of the “disastrous” move last November. The following are extracts from The Big Reverse: How Demonetization Knocked India Out, published by Harper Collins India. There is no doubt that the PM touched a deep chord in the heart of India, when he talked of the menace of corruption. The PM’s promise that Demonetisation would eradicate corruption was undoubtedly one of the main reasons for the initial goodwill towards Demonetisation from the very poor, despite the hardships it inflicted on them. Sadly, however, this promise too was belied. In February 2018, Transparency InterNaryomal reported That India continued to be among the most corrupt countries in the world. In the 2017 Global Corruption Perception Index report, India with a score of 40 points, was ranked 81, down two places from its ranking of 79 in 2016. Worse still, the report named India as the most corrupt country in the Asia-Pacific region, with 69 per cent bribery rates, which means that almost seven out of ten people had to pay a bribe to access public services. Vietnam was the second-most corrupt country with 65 per cent bribery rates, whereas Pakistan with only 40 per cent bribery rates, ranked much better than India. Japan came out as the least corrupt nation, with a 0.2 per cent bribery rate. Clearly, therefore, Demonetisation failed in its second big goal — eradication of corruption. If anything, the new 2,000 notes made it simpler for corrupt officials to take and stash away larger bribes, compounding the problem for ordinary Indians. The economic impact of demonetisation shows the truth of this statement. It was a totally unnecessary step which extracted a very high cost. Instead of taking much needed steps to make it easier to do business in India, the government paralysed businesses with the chaotic demonetisation. As demand fell and people started to buy less, firms cut back on production, which led to lower capacity utilisation. Confronted with falling demand and overcapacity, business people in the private sector postponed or reduced their investment plans. Unwittingly or otherwise, the architects of India’s 2016 demonetisation had accelerated the downward spiral in investment in the formal sector, mortally wounded those in the agriculture and informal sectors, caused innumerable job losses, and seriously impacted GDP growth. By not recognising this risk, the NDA government caused a reasonably well-functioning economy to stop dead in its tracks. By not acknowledging the damage they had caused, and hiding behind a maze of confusing data, the government compounded the demonetisation error. Since they refused to admit the blow that the economy had suffered due to demonetisation and remained in complete denial, they also could not take corrective actions to revive the economy. This state of denial, therefore, compounded one error with another, leading to a much slower recovery than would otherwise have been possible. Excerpted from The Wire – This article was originally published at Aeon and has been republished under Creative Commons. The Author, Alexander Bevilacqua is an assistant professor of history at Williams College, Massachusetts. In her Class Day remarks at Harvard’s 2018 graduation, the Nigerian novelist Chimamanda Ngozi Adichie addressed the problem of our rush to judgment. In the face of what she called “a culture of ‘calling out’, a culture of outrage”, she asked students to ‘always remember context, and never disregard intent’. She could have been speaking as a historian. The two approaches have different genealogies, but share a significant feature: at heart, they are adversarial. One mode of reading, first described in 1965 by the French philosopher Paul Ricœur and known as ‘the hermeneutics of suspicion’, aims to uncover the hidden meaning or agenda of a text. Whether inspired by Karl Marx, Friedrich Nietzsche or Sigmund Freud, the reader interprets what happens on the surface as a symptom of something deeper and more dubious, from economic inequality to sexual anxiety. The reader’s task is to reject the face value of a work, and to plumb for a submerged truth. A second form of interpretation, known as ‘deconstruction’, was developed in 1967 by the French philosopher Jacques Derrida. It aims to identify and reveal a text’s hidden contradictions – ambiguities and even aporias (unthinkable contradictions) that eluded the author. For example, Derrida detected a bias that favoured speech over writing in many influential philosophical texts of the Western tradition, from Plato to Jean-Jacques Rousseau. The fact that written texts could privilege the immediacy and truth of speech was a paradox that revealed unarticulated metaphysical commitments at the heart of Western philosophy. Both of these ways of reading pit reader against text. The reader’s goal becomes to uncover meanings or problems that the work does not explicitly express. In both cases, intelligence and moral probity are displayed at the expense of what’s been written. In the 20th century, these approaches empowered critics to detect and denounce the workings of power in all kinds of materials – not just the dreams that Freud interpreted, or the essays by Plato and Rousseau with which Derrida was most closely concerned. They do, however, foster a prosecutorial attitude among academics and public intellectuals. As a colleague once told me: “I am always looking for the Freudian slip.” He scours the writings of his peers to spot when they trip up and betray their problematic intellectual commitments. Not surprisingly, these methods have fostered a rather paranoid atmosphere in modern academia. Mutual monitoring of lexical choices leads to anxiety, as an increasing number of words are placed on a ‘no fly’ list. One error is taken as the symptom of problematic thinking; it can spoil not just a whole book, but perhaps even the author’s entire oeuvre. This set of attitudes is not a world apart from the pile-ons that we witness on social media. Does the lack of charity in public discourse – the quickness to judge, the aversion to context and intent – stem in part from what we might call the ‘adversarial’ humanities? These practices of interpretation are certainly on display in many classrooms, where students learn to exercise their moral and intellectual prowess by dismantling what they’ve read. For teachers, showing students how to take a text apart bestows authority; for students, learning to read like this can be electrifying. Yet the study of history is different. History deals with the past – and the past is, as the British novelist L P Hartley wrote in 1953, “a foreign country”. By definition, historians deal with difference: with what is unlike the present, and with what rarely meets today’s moral standards. The French medievalist Marc Bloch wrote that the task of the historian is understanding, not judging. Bloch, who fought in the French Resistance, was caught and turned over to the Gestapo. Poignantly, the manuscript of The Historian’s Craft, where he expressed this humane statement, was left unfinished: Bloch was executed by firing squad in June 1944. As Bloch knew well, historical empathy involves reaching out across the chasm of time to understand people whose values and motivations are often utterly unlike our own. It means affording these people the gift of intellectual charity – that is, the best possible interpretation of what they said or believed. For example, a belief in magic can be rational on the basis of a period’s knowledge of nature. Yet acknowledging this demands more than just contextual, linguistic or philological skill. It requires empathy. Aren’t a lot of psychological assumptions built into this model? The call for empathy might seem theoretically naive. Yet we judge people’s intentions all the time in our daily lives; we can’t function socially without making inferences about others’ motivations. Historians merely apply this approach to people who are dead. They invoke intentions not from a desire to attack, nor because they seek reasons to restrain a text’s range of meanings. Their questions about intentions stem, instead, from respect for the people whose actions and thoughts they’re trying to understand. For many historians (as well as others in what we might call the ‘empathetic’ humanities, such as art history and literary history), empathy is a life practice. Living with the people of the past changes one’s relationship to the present. At our best, we begin to offer empathy not just to those who are distant, but to those who surround us, aiming in our daily life for ‘understanding, not judging’. To be sure, it’s challenging to impart these lessons to students in their teens or early 20s, to whom the problems of the present seem especially urgent and compelling. The injunction to read more generously is pretty unfashionable. It can even be perceived as conservative: isn’t the past what’s holding us back, and shouldn’t we reject it? Isn’t it more useful to learn how to deconstruct a text, and to be on the lookout for latent, pernicious meanings? Certainly, reading isn’t a zero-sum game. One can and should cultivate multiple modes of interpretation. Yet the nostrum that the humanities teach ‘critical thinking and reading skills’ obscures the profound differences in how adversarial and empathetic disciplines engage with written works – and how they teach us to respond to other human beings. If the empathetic humanities can make us more compassionate and more charitable – if they can encourage us to ‘always remember context, and never disregard intent’ – they afford something uniquely useful today.